Asia’s growing economies will generate increasing amounts of waste, which requires a proper and environmentally safe disposal. According to the World Bank, municipal solid waste (MSW) generation is going to double by 2025, keeping in mind that OECD countries are still producing the majority of that waste. In Asia, the current average waste generation is approximately 0.9 kg/capita/day and is set to increase to 1.5 kg/capita/day within the next 10 years as standards of living and consumption rise. The current waste production in Asia stands approximately at 738,000 ton/day and will increase to 1,865,000 ton/day in 2025. The waste disposal in this region will be one of the major challenges for decades to come. Waste incineration is not a low-cost technology, and investment in this technology should be targeted carefully. MSW incineration should only be applied to waste that cannot be recycled in a way that creates usable products and at the same time eliminates pollution. In other words, you do not want to spend money to burn products that could be used or sold elsewhere. That said, if a recycling process generates in itself harmful waste or products that have no market value (e.g. polluted compost, mixed waste as residue of the RDF separation) and, as a result, these residues need to be landfilled, it is preferable to directly incinerate MSW since incineration results in the highest reduction of waste and destroys pollutants and plastics before they get distributed in the environment. Some people would argue that it creates new pollutants. The main reason for this argument is the potential formation of dioxins, furans and VOC. This has been intensely researched in Europe, namely Germany, starting early 1990 and technologies have been adapted to address these issues. State-of-the-art technologies minimize such dioxin formation by maintaining the incineration temperature at high levels for a sufficiently long period (two seconds above 850 degrees C) and avoiding secondary dioxin formation after the boiler, typically in the electrostatic precipitator due to the presence of heavy metals, chlorides and VOC, by using bag filters instead. These bag filters are also useful to capture any remaining dioxins by the addition of activated carbon and maintaining concentrations well below the 0.1 ng/NM3. The residues are then landfilled together with the fly ash. Redistribution of waste is a major concern. In particular, plastic pollution and micro-plastics is recognized as a major problem worldwide. Several scientists have argued that we are now living in an anthropocene or an “Age of Plastic,” as our plastic waste leaves noticeable traces on rock layers of mountaintops to deep ocean floors and can be fossilized into the far future. Not to mention, the yet unknown risks of plastic entering our food chain. Landfilling does address the redistribution of plastic to a certain degree and for a limited duration, if the landfills are immediately closed and maintained well. However, not even the most sophisticated landfills can guarantee that the pollutants remain there for an unlimited time. Plastic breaks down slowly and becomes brittle with time, due to loss of softeners, typically Phthalates. Other natural forces such as UV radiation and mechanical forces break up the plastic into smaller pieces. Typical waste composition: Proximate analysis and calorific value of MSW source. Image courtesy of World Bank, 2012. Methane emissions from biomass in landfills contribute to the greenhouse gas effect to a larger extent than potential carbon dioxide emissions resulting from incineration. Furthermore, uncontrolled burning of waste on landfills, which happens more often than not, emit uncontrolled Dioxins and Furans in high concentrations—those exact components which are often raised as main argument against MSW incineration. Most landfills in Europe and the U.S. do control water leachates, (as long as the sealant is really sealing and not damaged, since leaching from a damaged sealant cannot be monitored, it leaks into the soil). Hence, why the European Union has more or less banished landfills. Landfill gas is only collected in larger landfills and turned into electricity by feeding gas engines, in the absence of such electricity generation, there is no collection, treatment of landfill gases nor any monitoring of such. The moisture in Asian waste stems from the fact that all waste, plastic vegetable greenery, etc. is collected and not separated. If the green waste were to be collected separately, the moisture in the waste would be reduced significantly. Typical waste in Asia (city area is around 1,700 kcal/kg) can readily be burned. Countryside waste is around 1,100 to 1.300 kcal/kg and is arguably more difficult. However, if waste were to be collected separately, e.g., green waste and fresh vegetable waste collected for composting, the calorific value would increase significantly as has been demonstrated in Europe in the 1990s. By collecting waste separately due to the introduction of a waste fee, the calorific value jumped within days from around 2,300 to over 3,000 kcal/kg, so for Asian waste this would mean an increase from 1,100 to at least 1,700 to 2,000kcal/kg. In summary, waste disposal in landfills, particularly uncontrolled dumpsites, scavenging for waste separation and partial waste incineration without proper segregation cannot be the solutions for the growing waste generation worldwide and, in particular, in Asia. 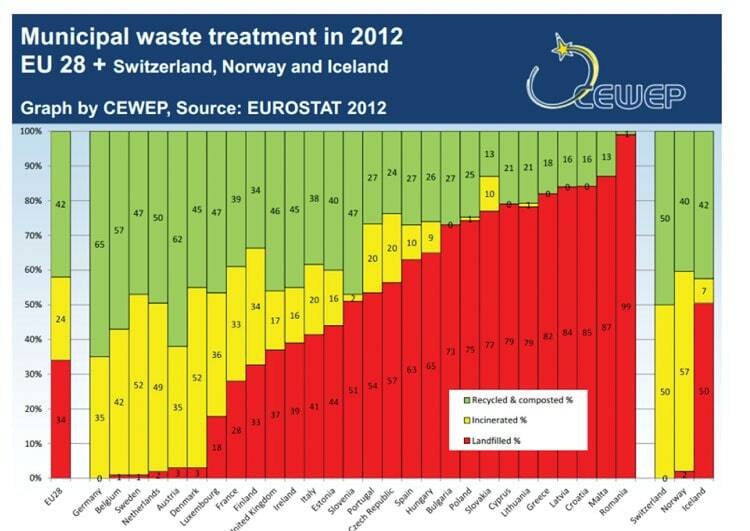 Waste treatment status of Europe. Image courtesy of CEWEP, taken from the Eurostat 2012 book (European Commission). Many proponents argue that waste reduction through separation and recycling of waste is an effective method to reduce waste. While it does allow for some plastics, metal and paper to be recycled, most of waste still remains in the landfill. Waste separation processes after collection of waste, such as those that are currently applied in Asia, often results in a substantial amount of solid waste, which needs to be landfilled. In the long term, the current system is not sustainable. The plastic residues are not fully removed from the final residue and this final product is still a potential polluter through uncontrolled burning, methane fermentation and leaching of chemicals. Therefore, alternative ways of waste management should be considered and many European countries have good examples of how this can be managed. As mentioned in the introduction, waste incineration is not a low-cost technology and it is important to only treat waste that has no further usage. Furthermore, a waste incinerator has technical limitations on what it can burn, in particular regarding the calorific value of waste. The higher (also with certain limitations) the calorific value of waste, the more efficient the combustion process and the more cost efficient the investment. To get reasonably high calorific value for MSW, it is important to reduce moisture and organic material. Organic material is, in most cases, generated as vegetable and food waste. Vegetable and food waste have high moisture contents, and therefore, are not suitable for waste incineration. It would be preferable to collect these types of waste separately, and manage them at a compost facility, which makes them a more valuable resource. While it is true that it is very difficult to force households to start separate bio-waste collection, it can be a relatively easy start to collect this waste separately in fresh markets and shopping malls. These facilities could supply a sufficient amount of organic waste to justify the development of a composting plant. Organic waste that is correctly collected and not mixed with other hazardous waste like plastic, batteries, glass, etc. will have a market value. Once people notice the benefit of such a system, the government or municipalities should promote this kind of separate collection through education and/or economic incentives combined with expansion of separate collection centers in certain cities or districts. Other waste streams could be collected similarly in larger shopping malls—PET bottles, aluminum cans, glass bottles etc.—through dedicated collection points as is done in many European cities. It is a question of policies introduced by the Government. It works in Singapore. It works partially in China, so why not? There is a way of motivating either by fines or by financial benefits, but it needs an interested government to get involved. Currently, the waste in most Asian countries is separated at the landfill site after it has been collected. That results in polluted fractions for all waste streams, e.g. organic waste is polluted with plastics and batteries, plastic is polluted with food, etc., and as a result, none of the fractions really have a proper market value. As an example, one single battery in one ton of organic waste makes it unsuitable as a soil enhancer or compost because it exceeds the limitations for heavy metals and so, most likely, the unsold compost will end up back in the landfill. These are all good reasons to introduce such a system. But it requires the governments to take up the initiative and introduce suitable policies. This system does not develop by itself and no private developer can introduce it on a large scale on its own. We must do something proactive. Offering possible suggestions, albeit with cost implications, would be a better solution to address this issue, than just doing nothing. Several developers and suppliers promote refuse-derived fuel (RDF) as opposed to MSW incineration because the fuel has a better quality, less moisture and, thus, higher calorific value. Nonetheless, RDF is not a final solution for the waste treatment as long as there is no separate waste collection system simply because it treats only one part, the best part, of the waste stream, and a large portion of the residue, containing plastics and other pollutants is left to be landfilled. In Asia, several developers have this idea to produce RDF because the waste is too wet, taking the combustibles out to burn and dump the rest back into the landfill. This results from a misguided policy that demands high efficiency power plants from waste (treating waste incineration as power plants) where in fact the goal should be reducing waste. 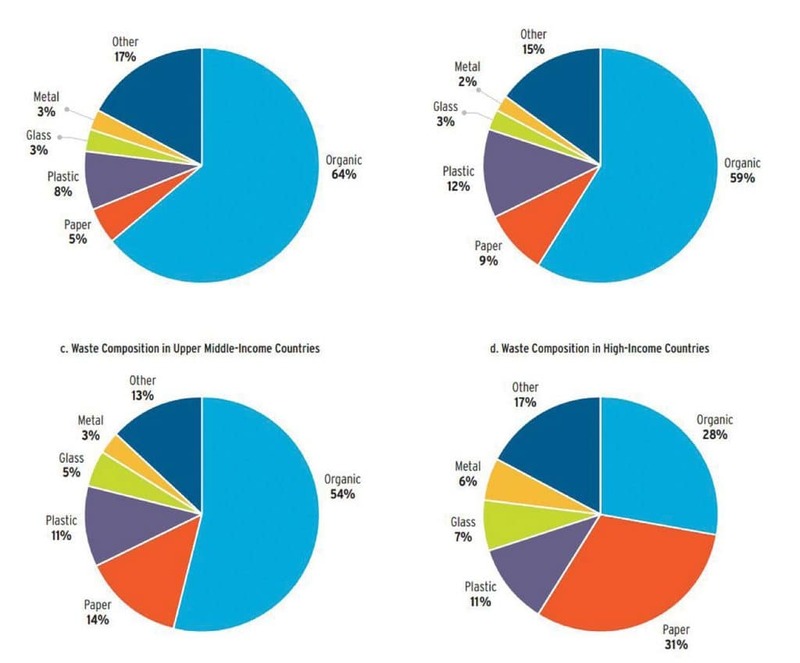 Most Asian countries allocate their budgets mainly for waste collection and only a minor portion for waste treatment. Some Asian countries try to circumvent this budgetary problem by inviting private developers to build Waste-to-Energy (WtE) plants and giving an incentive for the electricity sold. That forces the developers to optimize the power plant and, most importantly, fuel efficiency because payment is made for generating electricity as opposed to getting rid of the waste through a tipping fee. This approach defeats the purpose of eliminating the waste and as a result many private developers in these schemes resort back to using RDF or pure industrial waste instead of MSW, which then brings us back to the initial problem that not all waste is properly disposed. MSW incineration should be a solution that makes landfilling obsolete. Hence, in the absence of a systematic and separate waste collection for biodegradable waste, direct MSW incineration is the preferred method of waste treatment. It ensures that no plastic residues and other polluting residues are spread in the environment. The solution in Europe is to reheat the ash, stabilize the heavy metals in for mof hydroxides and mix it with concrete. That creates a safe product to be landfilled without the risk of leaking. In Japan and Taiwan, the ash is molten and made into glass which also fixes the heavy metals in the glass matrix and makes them insoluble. That material is then used for construction purposes and completely safe, so as a result, there is zero landfill. The other argument against MSW incineration is the formation of dioxins and furans. The technologies to limit emissions of these toxins have been developed and applied successfully over the past decades. The majority of MSW incineration plants in Europe demonstrate that both dioxins and furans can be removed from the flue gas to levels below 0.1 ngTEQ /Nm3, well in line with World Bank and EU standards. The air pollution control devices for the newest plants e.g Finland) are bag filters with lime and activated carbon injection, which are not really expensive and very efficient. They maintain highest EN standards. First, the emissions are controlled and monitored online and are available to the Authorities online as well, so bypassing the system is not an option, not even in less developed countries like Thailand. RDF works well in countries that have a well-developed separate waste collection or in cases where remote areas send their waste to a central MSW incineration plant and are forced to reduce the volume by producing RDF. In the absence of such a separate waste treatment or remote plant, direct MSW incineration should be the preferred solution. Back at the end of the last century, gasification of waste was introduced into the markets in Europe as being the magic bullet for MSW treatment. The main difference between incineration and gasification is the formation of a syngas under sub-stoichiometric conditions, i.e. under very low oxygen content. The syngas is then burned in a separate chamber at high temperatures. Some other, more exotic processes use this syngas to produce oil. The main argument was to lower the amount of flue gas due to lower excess oxygen and the fly ash being molten at high temperatures and crystallized to glass, thus keeping all heavy metals and pollutants locked in this glass. Examples of such technologies were the much praised Thermoselect process, the JFE Process and a Siemens KWU Schwarze Pump Process. Only a very limited number of projects primarily using a very selective RDF have been operated in Europe with mixed success and many plants closed down operation. Some of the technologies were bought by Japanese companies and built in Japan. The driving force was the high cost of the final landfilling of the fly ash but even so, most of these plants in Japan have stopped operation. Main problems are low plant reliability, formation of tar, which requires regular cleaning, high operation cost, and as far as we are aware, currently only one new plant is being planned (using pre-treated RDF) in the UK. There are no new plants are planned or built either in Japan nor in Europe. As for the future in Asia, MSW gasification is not a viable solution. It has not really proven to be economically viable on a large scale. Furthermore, the main argument in favor of gasification, landfill cost for ash is not really applicable, because the landfilling cost for fly ash is still cheap. Environmentally, none of these technologies have proven to be superior to direct MSW incineration. 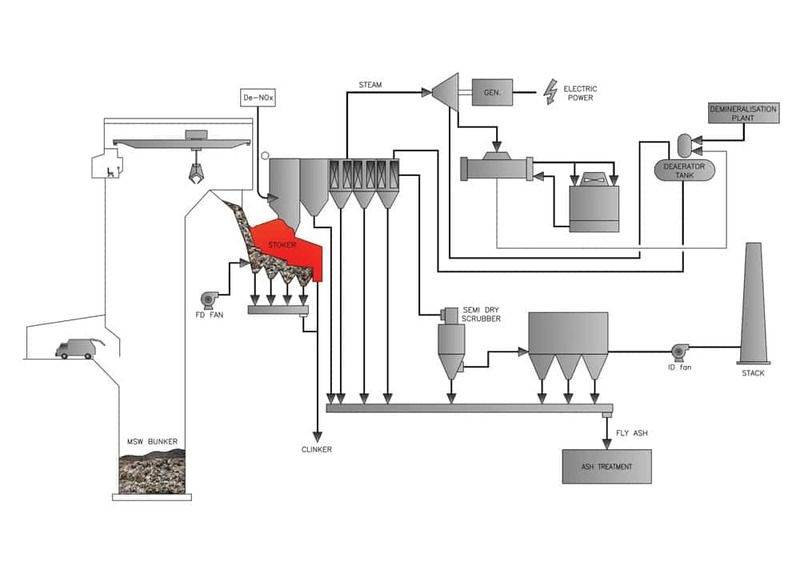 MSW incineration process. Image courtesy of Poyry, 2018. CFB technology is praised by some suppliers as the preferred technical solution for MSW treatment. In cases where the developer has chosen RDF as fuel, this technology is indeed suitable. However, it needs to be pointed out that, for the reasons I have mentioned previously, RDF production from waste is not a sustainable solution for waste disposal. CFB technology has a much more limited fuel flexibility compared to stoker incinerators. Not only is fuel calorific value limited, but also fuel size since all fuel needs to be shredded before it enters the incinerator. As a general guideline, the most flexible technology that allows MSW to be treated directly without any further pretreatment is the stoker or step grate MSW incinerator. It is for this very reason why more than 90 percent of all plants in Europe and Japan are based on this technology. Efficient and effective waste disposal requires a government level policy that takes a holistic approach into account. The goal should be the reduction of waste through separate waste collection, efficient recycling of waste, biological treatment of organic waste and incineration of residual waste. This could be paid for by charging a waste fee in richer areas and giving households a tax reduction or a payment for proper disposal in poorer areas. RDF preparation from waste and RDF incineration is a measure applied to improve the economics of incineration mainly due to lack of proper waste policies. It does not provide a solution to get rid of MSW landfills. Waste gasification is a technology with some limited applications in Japan, but it has not been successfully operated in any European country where the vast majority of MSW treatment is based on stoker incineration. Currently Indonesia and Thailand are at the forefront to develop waste incineration. China is already well advanced in large cities. Furthermore, landfills in soils with high ground water tables like most Asian cities are a problem as the sealant is by no means really waterproof. Leaching into ground water has been and is a continuous problem. Modern MSW incineration technologies, if properly designed and operated are safe and emissions of pollutants are controlled. Dioxin and Furan emissions are kept with the limits set by the EU and World Bank. Dr. Alexander Skaria is Director of Engineering and Marketing of Pöyry Energy Ltd., Thailand. He holds a M.Sc. and a Sc. D. in Chemical Engineering. In the last 25 years, he was involved in various thermal power plants, flue gas de-sulfurization plants, waste-to-energy plants, gasification plants and various manufacturing plants and industrial parks in Switzerland and in Southeast Asia. His technical qualifications cover the conceptual design, preparation of tender documents and cost estimates, bid evaluation and contract negotiations, detailed design and site supervision. Dr. Skaria has been involved as a process expert in waste-to-energy projects in Switzerland and in Southeast Asia as well as a Process expert and Project Director in various power projects. Furthermore, he has been involved as senior process specialist in most of Pöyry’s most recent 20.6 MW Gulf Chana Wood chips fired power plant in Thailand where Pöyry is the Contractor’s Engineer. To contact Dr. Skaria, call +44 207 413 3433 or e-mail Aleona.Krechetova@hkstrategies.com.